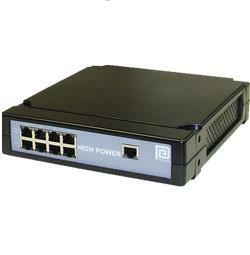 POE15M-1AF Phihong POE Injector small profile. C6 input mains connector with earth. 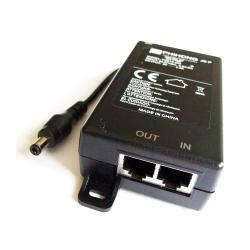 Compact 15W single port PoE midspans designed to power IEEE802.3af compliant applications, including: IP telephones, wireless network access points, and security cameras. 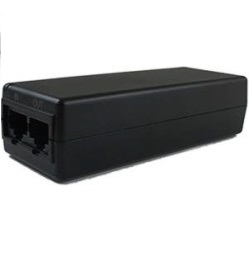 Currently available in two versions — the POE15M-1AF, which features an IEC320 C6 connector, and the POE15W-1AF, which features an IEC320 C8 connector — POE15 Series midspans measure a slight 7.2 cubic inches, deliver 15.4W output power at 56VDC, and integrate into networks at gigabit speeds. “Measuring half the size of typical 15W PoE midspans, the POE15 Series enables smaller overall package sizes for end products like VoIP phones and security cameras, which tracks with consumer demands for ever-smaller devices,” said Keith Hopwood, vice president of marketing for Phihong USA. 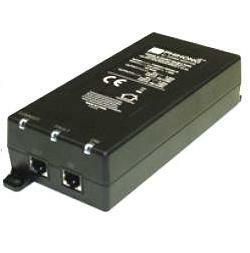 Rated for AC input voltages spanning 100–240VAC, POE15 Series midspans feature full over-voltage, over-current, and short circuit protections per the IEEE802.3af specification, and an LED indicator that communicates when the device detects a valid load, is active with no load, or is experiencing overload conditions. Compliant with CE, cUL/UL 60950-2, IEC/EN 60950-2, and LPS safety standards, the new 15W single port midspans can be safely operated in temperatures ranging from -20°C to +50°C, and can tolerate humidity levels spanning 5–90%. Both devices in the series measure 106mm (4.17”) x 40mm (1.57”) x 27mm (1.10”), weigh 100g (3.5oz), and are covered by a one-year warranty.